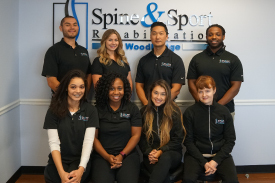 At Woodbridge Spine & Sport Rehabilitation, our primary goal is to restore function in your body. We offer services including chiropractic care and physical rehabilitation therapy. We use assessment modules to determine the precise area of dysfunction and to correct the problem. Through treatment, our intention is to help your body heal and to achieve the goal of functional restoration. Ultimately, we want to correct the areas of dysfunction and then send you on your way with instructions for exercises and a healthy lifestyle so you can maintain the proper physical health on your own. We understand there are some patients who require maintenance care due to previous surgical procedures or other extenuating circumstances. We’ll help you no matter what your needs. Using a unique combination of chiropractic adjustments, physical rehabilitation therapy and myofascial techniques, your doctor will work with you to restore proper function to your body and relieve your pain.